The symptoms of mold development are rather unpleasant and require proper attention. The musty odors and the gross-looking spots and splotches are unappealing, to say the least. When challenged with a serious mold infestation, commercial and residential property owners can easily get lost in all the stress. As daunting the issue may seem, mold must be handled with a sense of urgency. 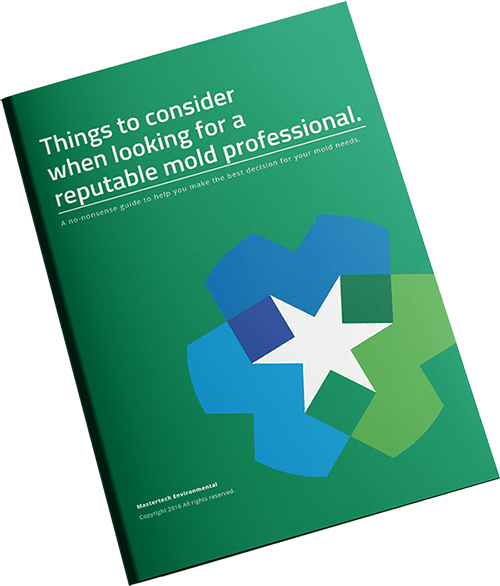 Addressing a mold problem in the early stages of development will make all the difference– it will help to reduce the chances of further, costly property damage and help to avoid health issues from prolonged mold exposure. Call a professional who specializes in mold services to answer all your questions and and schedule a mold inspection. Sometimes it is difficult to figure out if it’s mold or not mold. Our Audubon, NJ mold inspections are designed to locate your mold issues quickly and determine why they began in the first place. Our Mold Inspectors are trained and certified to safely thoroughly, and efficiently perform mold inspections and testing. Moisture is the number one cause of mold in NJ homes and businesses. All of our mold inspectors are equipped with moisture meters and thermal imaging cameras to find moisture sources that can cause mold. MasterTech mold inspections are developed to be the least invasive to your property as possible. For your safety, we try our best to avoid any unnecessary destructive tactics during your inspection. For example, we try to avoid prematurely ripping up carpet, cutting into drywall, lifting wallpaper, etc. While these methods make it easy to see what is going on, they are destructive and risk cross-contamination if the property is not under proper containment and protection. Visual Assessment- Your MasterTech Inspector will complete a comprehensive visual analysis to determine any conditions that could stimulate mold growth in your Audubon, NJ property. We will provide you thorough digital documentation for your records. Moisture Mapping- Your inspector will carefully map out the wet areas of the property to determine where the water source begins and ends, while avoiding any unnecessary demolition or invasive tactics. Moisture Meters: Moisture meters allow us to read the moisture content of building materials. Moisture locked within porous building materials can go unnoticed for a long time. Thermal Imaging: Your inspector will be taking advantage of the temperature difference between wet and dry materials. Thermal imaging will allow your inspector to clearly identify all wet areas and paint a picture of the mold spread. Mold Testing- Surface and/or air quality tests will provide scientific data that will confirm or deny mold presence. If mold presence is confirmed, the test results will help your inspector figure out the most appropriate course of act to resolve the mold issue. Report of Findings- Your inspector will compile a clear and concise report that outlines all his/her findings. If deemed necessary and requested for, your inspector will present you with a detailed scope of work for a Camden County NJ mold remediation. The trained and experienced mold removal experts at MasterTech Environmental have taken time and care to develop the safest, most efficient, and most effective mold remediation process to ensure the most thorough and successful restoration of your Audubon, NJ property. 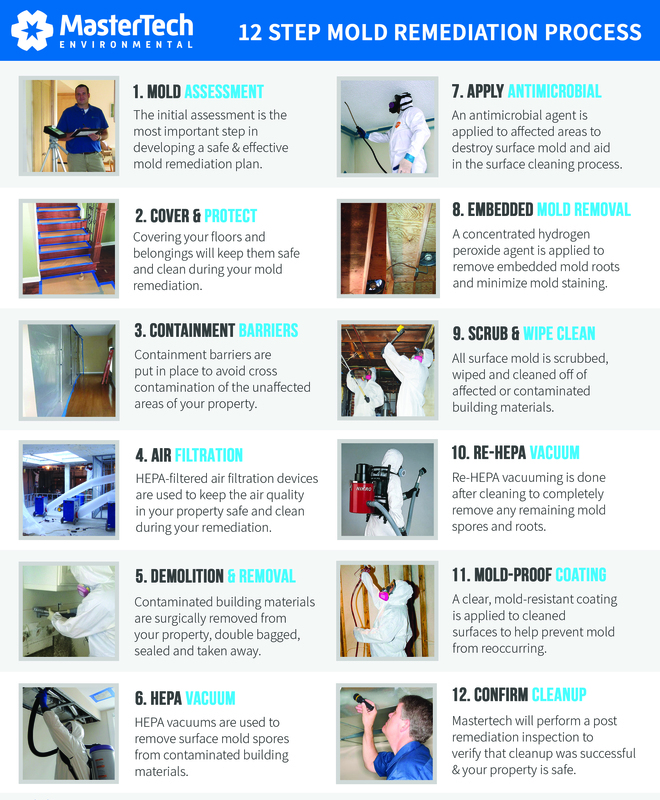 Each step in our 12 Step Mold Remediation Process was consciously put into place to safeguard the efficiency of your Audubon, NJ mold remediation. All of our mold removal technicians receive extensive, specialty training to appropriately handle the mold in your property. When it comes to mold, post remediation prevention plays just as important of a role as the actual mold removal. Each detailed scope of work will always include preventative measures to avoid mold recurrence in the future. In some cases, mold prevention will require additional work. However, often times, property owners can easily handle prevention on their own with some advice and guidance from a mold professional. Once we have confirmed a thorough and effective cleanup, each mold removal in Audubon, NJ is backed by a 5-year, mold-free warranty. It is our promise that the job was done right the first time. MasterTech Environmental provides top notch mold removal services in New Jersey. If you are experiencing signs of a potential mold infestation in in your Atco, NJ home, call for a professional mold inspection and mold removal in Atco NJ. For mold remediation and mold inspection in Clementon NJ call 1 (800) 310-3226 today. We will be happy to answer all your questions and set you up for an appointment with one of our well-trained inspectors.